Performing, Promoting, Networking, Organizing, Managing, and Enjoying Music. It's what we do. 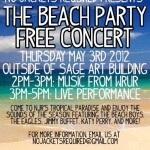 NJR Presents: The Beach Party! 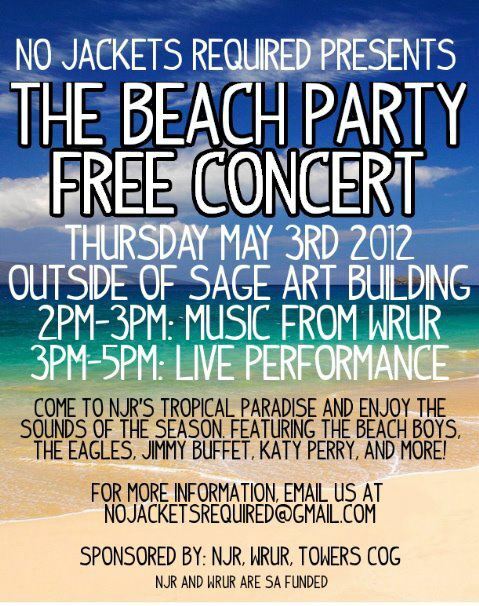 NJR is putting on a free concert tomorrow, May 3 at 2pm outside of Towers (by the Sage art building), cosponsored by WRUR and Towers COG! The first hour will feature DJing courtesy of WRUR, and then at 3pm your fellow NJR members are going to put on an awesome, live concert featuring fun music from such artists as The Eagles, TheBeach Boys, Katy Perry, Jimmy Buffet and more! This is a perfect opportunity to take a break from studying for finals and relax! Additionally, the Towers COG is going to have some fun activities to do while the concert is going on! And if you’re comi ng, don’t forget to RSVP for the Facebook event! Copyright © 2019 No Jackets Required All Rights Reserved.